CITY HALL — The $500 million renovation of Wrigley Field — including adding a video screen and right-field advertisement and developing land around the historic ballpark — was approved by Chicago aldermen Wednesday afternoon. The City Council unanimously approved the Cubs' long-sought plan to upgrade the 99-year-old landmark stadium during a meeting Wednesday. The Cubs plan to implement the changes over five years. A spokesman for the team thanked Mayor Rahm Emanuel, Ald. Tom Tunney (44th) and the rest of the city's alderman for signing off on the plan. "We are especially thankful for the leadership, time and energy of Mayor Emanuel," spokesman Julian Green said. "Thanks to his efforts, we are one big step closer to a major investment in one of the top tourist destinations in the state and a major economic engine for Chicago." Emanuel called the vote an important step in the economic development of Wrigleyville, Lakeview and the the city. "This investment is about modernizing the facility, but also investing in the community so they participate in the economic growth and opportunity," the mayor said. The Wrigley Field renovation cleared the final committee-level hurdle Tuesday and headed to the full City Council for approval after several last-minute tweaks, including putting on hold a pedestrian bridge over Clark Street. At the end of a marathon session Tuesday, the Zoning Committee put its stamp on the rehab project, following the lead of the Committee on Chicago Landmarks and the Plan Commission, which signed off on the project with minor changes earlier in the month. Tunney said he won concessions from the Cubs on the project, in tandem with Emanuel. 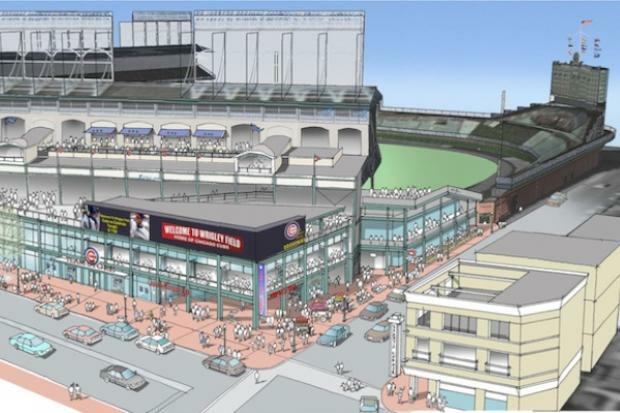 The Cubs agreed to defer plans to build a portico on a proposed 182-room hotel on Clark Street, which was to connect to Wrigley Field via a crosswalk bridge spanning Clark. The organization said it would reconsider placement of the hotel entrance from a side street to either Clark or Addison street. But the actual approved project did not put the deferrals in writing. The delays on points that were critical to the alderman's support are based on political trust between Tunney, Emanuel and the Cubs. Such a caveat was not lost on Tunney, who delivered an emotional "off-script" speech on the importance of the community's need, pressuring the team to keep promises and the implications for the rest of the Council. When the team, then owned by the Tribune Co., got the approval to add more night games 10 years ago, they promised parking that never came, Tunney said. This time, he will be pressuring the Cubs to follow through on "good neighbor" agreements, he said. "No more head fakes," Tunney said. Tunney told other alderman they, too, must represent constituents and that one day they may have to fight for their communities in a "challenging" situation. He said did not want to have a "civil war" in the Council, but Tunney reminded alderman that when their day comes, he will support them as they should support him. "We're not naive. We're not afraid of change," he said. "But we want to be respected." Details like the Clark Street bridge would be deferred "let me emphasize — indefinitely," Tunney said earlier in the week, later adding that would be "a very, very long time," if ever. Tunney and the mayor also got a concession from the Cubs that the two approved outfield signs would be the only ones the team would build, at the very least, until their contract with rooftop owners expires in 10 years. Tunney encouraged the Cubs and rooftop owners to continue negotiations. Cub spokesman Green said Tuesday that the city offered the team "no assurances" that the rooftop owners wouldn't sue them over the renovation plans, and another spokesman said the team would continue to talk with rooftop owners. Emanuel supported Tunney on the Council floor, commending Tunney for being a "tireless advocate" for the community and saying a total of 44 items in the framework have been adjusted in the last three months. "I have to think we struck the perfect balance," the mayor said. The Cubs said in a statement Tuesday that the team still needs to resolve "outstanding issues" with rooftops and adjust the night-game ordinance to meet Major League Baseball requirements. The team has aimed to start construction in the offseason this year. There is no timeline on public discussions about extending Sheffield Avenue 8 feet for a patio. In his Wednesday statement, the Cubs' Green said more talks are needed on some details. "We look forward to beginning construction on our $500 million plan, but before we do, we must resolve once and for all the threat of litigation and the enforcement of existing rooftop ordinances and long-term certainty over control of our outfield," he said. "We also look forward to discussing with Ald. Tunney potential alternatives to the Clark Street bridge and the hotel portico."